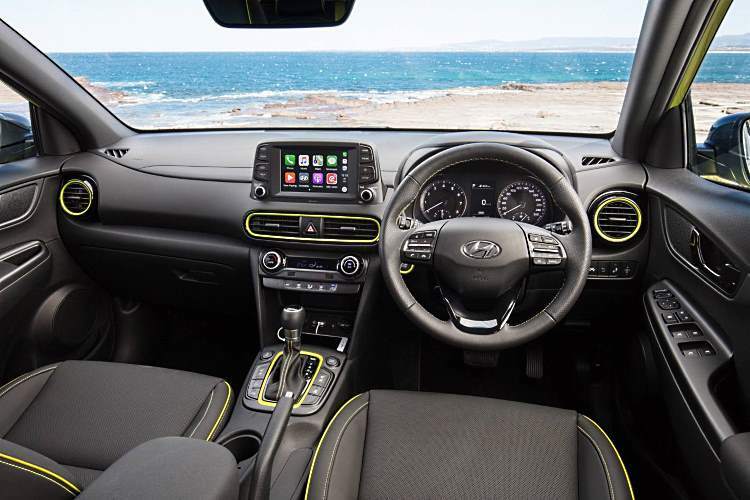 Just when you thought that there couldn’t possibly be room for another small SUV in the Australian marketplace along comes the Hyundai’s offering … the Hyundai Kona with a price tag that sets it apart from many of its competitors. 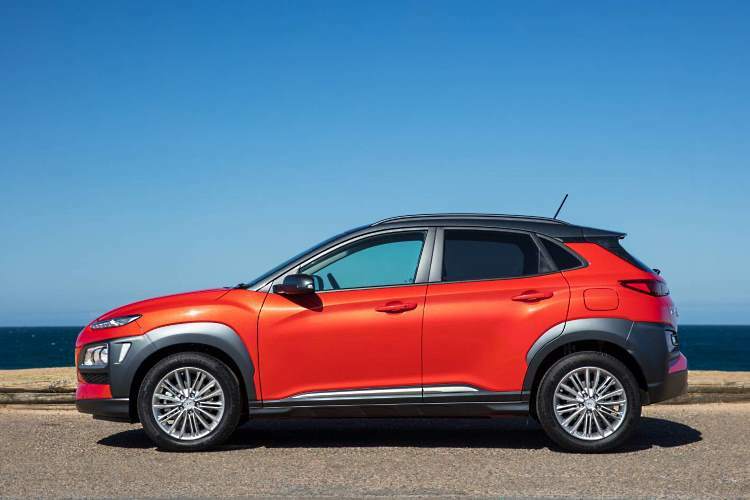 At $27k drive away the Hyundai Kona is definitely not the cheapest in its class but it does comes with some interesting technology. But are the buyers in the small SUV market all that interested in technology over price point? Hyundai says that it wants to appeal to the emotions of potential buyers rather than bedazzle them with all that technology and I guess we will just have to wait and see if that will work. As with all Hyundai SUVs the Hyundai Kona SUV will come in three trim levels; Active, Elite and Highlander. An optional safety pack will be available for the Active. Each of the trim levels will be available with two drivetrain combinations. A 2.0-litre naturally aspirated engine coupled to a six-speed auto transmission driving the front wheels will probably be the drivetrain combination of choice for most buyers but there is also be a 1.6-litre Turbo-GDI engine coupled to a seven-speed dual -clutch transmission driving all wheels available for those who want to be a little different. The 2.0-litre engine features multi-point fuel injection and Atkinson Cycle technology to deliver better fuel economy without any loss of power or torque. 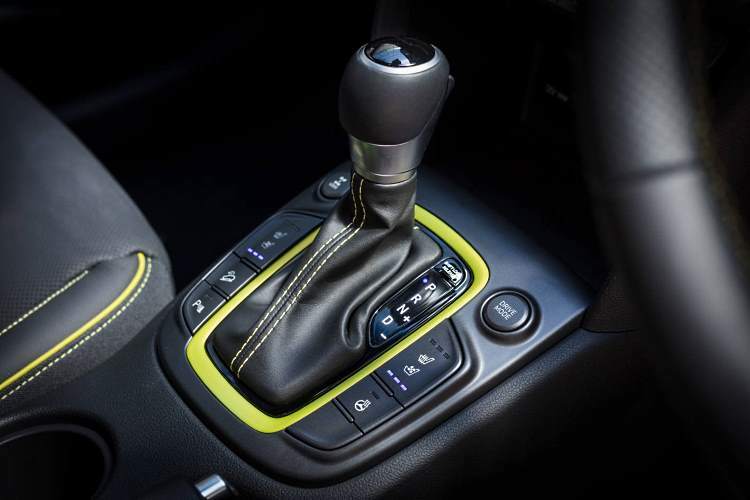 That combination produces 110 kW of power and 180Nm at 4,5000rpm and, when paired with the six-speed transmission, that combination takes the vehicle from 0 to 100km/h in 10 seconds flat. That’s hardly breathtaking but it’s not too shabby. 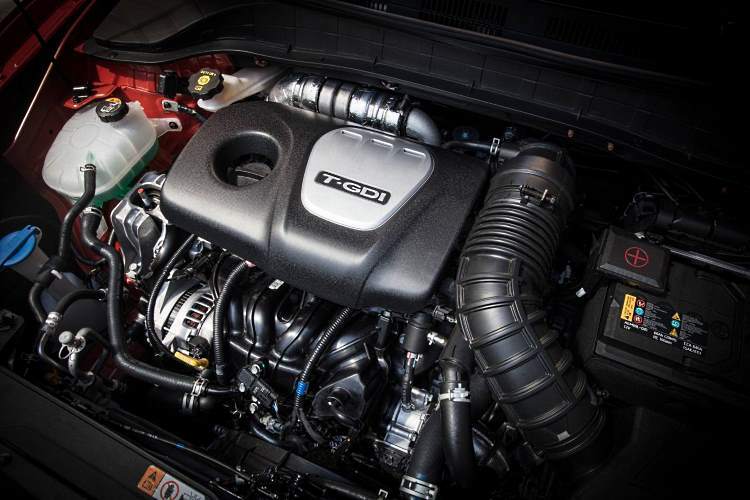 The turbo-charged 1.6-litre engine offers more spirited performance and will do 0 to 100km/h in 7.9 seconds. Along the way it will produce 18% more power and 47% more torque than the 2-0-litre engine. Power output is 130kW at 5,500rpm and torque is 265Nm at 1,500rpm and doesn’t reduce till the engine reaches 4,500rpm. Different drivetrains mean different suspensions for the Hyundai Kona SUV. Independent MacPherson strut design in common for the front suspension in both drivetrains but things are quite different at the rear. 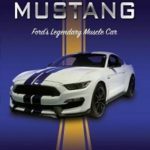 The front-wheel-drive versions feature torsion beam suspension while the all-wheel-drive version features dual-arm, multi-link suspension to give a smooth ride over a broad range of road surfaces. Let’s face it, even if you’re never going to take the Kona off-road you’ll still encounter that “broad range of road surfaces”. While many of those safety features are missing from the Active model they are available in a safety pack that looks to be well worth the extra money. And if all that isn’t enough to stop you having an accident then the six airbags that are standard across the range should go some way to keeping you safe. There was a time when actually driving a vehicle took up all of our attention but those days have gone and it’s important that we have plenty of infotainment to stop us from becoming bored. 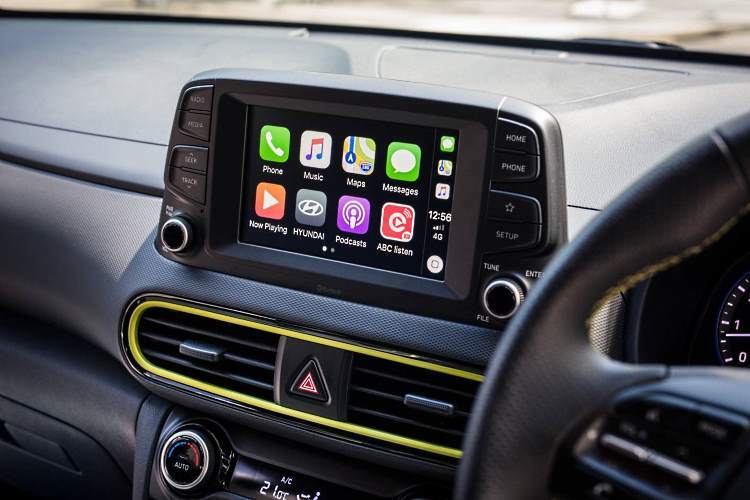 To help keep you entertained the Hyundai Kona as a 7-inch tablet-style touchscreen that gives you access to advanced connectivity features such as Bluetooth and audio streaming, iPod and smartphone connectivity through Apple CarPlay and Android Auto. 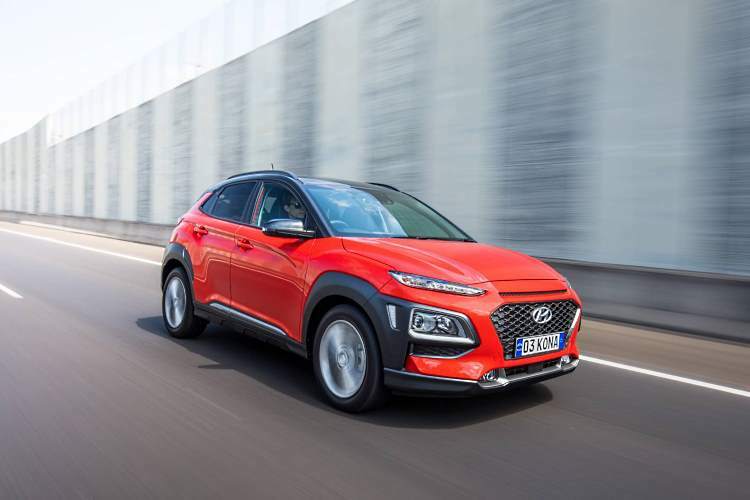 Hyundai want the Kona SUV to be a technology leader in the small SUV class and to achieve that they have included a range of features that were once the domain of larger luxury vehicles. Standard on the Kona Highlander is a Head-Up Display that projects drive-related information onto a clear glass panel behind the instrument display. It’s designed to give maximum visibility without being distracting and you can turn it off simply by pressing a button. 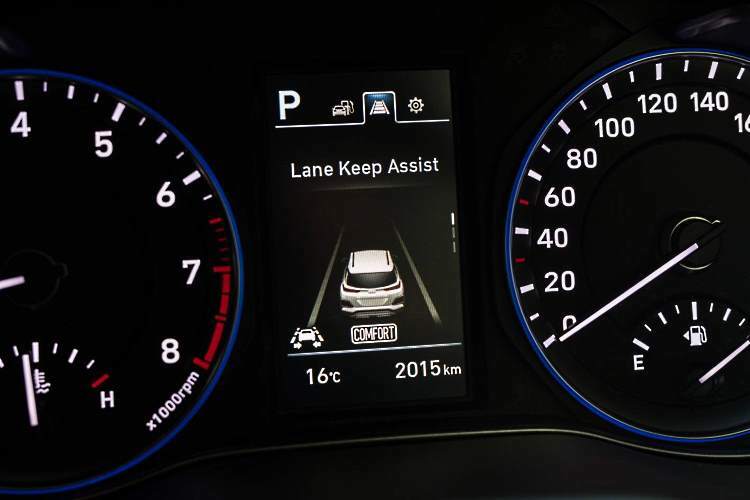 LED headlights designed to follow the direction that the steering wheel is pointed is also part of the mix along with wireless smartphone charging. 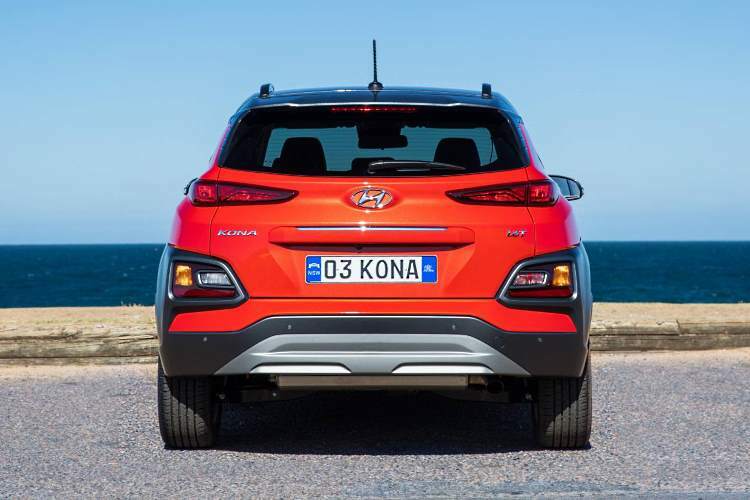 Hyundai Auto Link is also part of the technology suite in the Kona SUV. This handy features connects the Kona to your smartphone and gives you access to everything from real-time diagnostics … including things such as tyre pressure … to automatic access to roadside assistance if needed. Electrically adjusted driver’s and passenger seats … with a total of 10 adjustment settings … are designed to make things as comfortable as possible for drivers and passengers. Climate control on the Elite and Highlander models add to the comfort levels and the system features an automatic windscreen defog function for added safety. Hyundai says that the Kona has plenty of space for five occupants … they don’t actually five adults … and luggage space is limited to just 361 litres with the back seat in place. 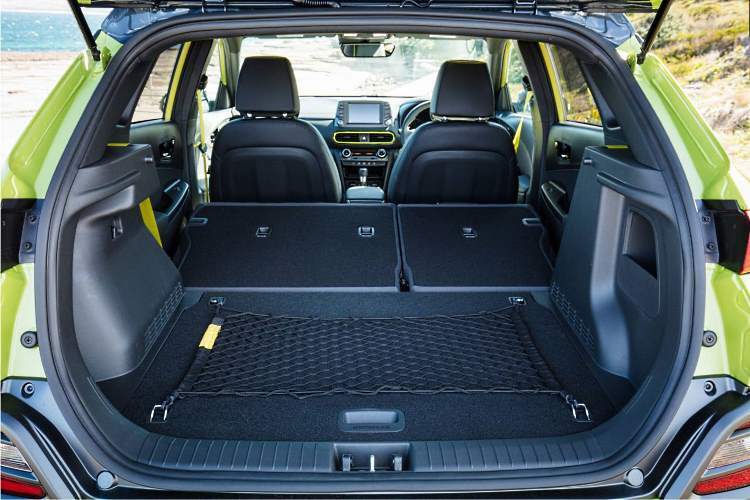 However the rear seat can be totally folded and that lifts the luggage space to 1143 litres and the rear seat also has a 60/40 split-fold feature. Perhaps the mostly interesting interior feature of the Hyundai Kona is the ability for owners to change the height of the boot floor. The lower setting gives more cargo space while the upper setting gives a totally flat loading area when the rear seats are folded. So will people buy emotion and technology over price point in a very competitive market? We will just have to wait and see.